Samsung has raised objections to a "how patents work" video created by the Federal Judicial Center to provide jurors with an introduction to the patent system, claiming it would be "highly prejudicial" to expose jurors to the idea that Apple invented original products worthy of being patented. Update: Samsung's objection has been overruled. 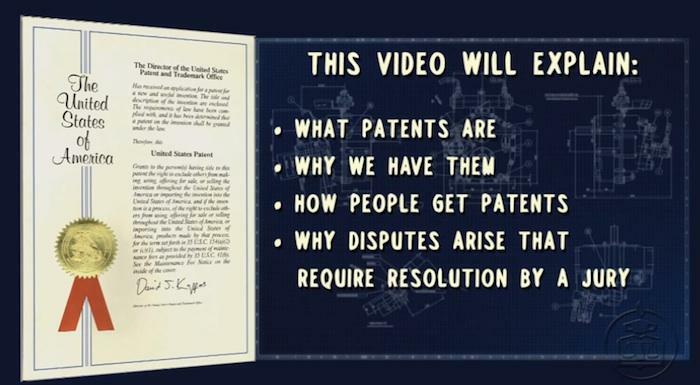 The FJC video (embedded below), was developed by United States District Judge Jeremy Fogel, for the purpose of explaining to jurors involved in patent cases what a patent is, why they exist in law, how inventors obtain patents and how courts resolve patent disputes in a jury trial. At the beginning of the first Apple vs. Samsung case, jurors were shown a similar video. However, over the past year the the FJC developed an updated version, replacing the dated-looking earlier edition that depicted actors wearing lots of plaid (below). The new video (below) appears on the US Courts YouTube channel, where it is described as being "carefully crafted, in consultation with judges and members of the bar, to present a balanced view of the patent process," noting that "individual judges will want to review it carefully and consult with counsel before deciding whether to use it in a particular case." Samsung has filed an objection to showing the video, stating that "the FJC video includes several scenes in which Apple products are depicted and used." Samsung's attorneys detailed each minute of film where an Apple product appears, noting that "at the 2:55 mark, a series of Apple products are shown, including an iPad, a newer model of a laptop computer, and an iPhone. The narration during this portion of the video addresses how the disclosure of a patent may 'inspire new inventions.'" Samsung doesn't also mention that the video segment begins with the depiction of a user typing on an early 1980s Apple II computer. Then, at the "approximately the 4:10 mark, during the discussion of what an 'invention' is, an actor playing an 'inventor' is shown at a table using an Apple laptop computer," Samsung's brief continues. "At the 4:35 mark, the requirements that a patent be new, useful and non-obvious are shown on the screen in front of a still image of an Apple computer." 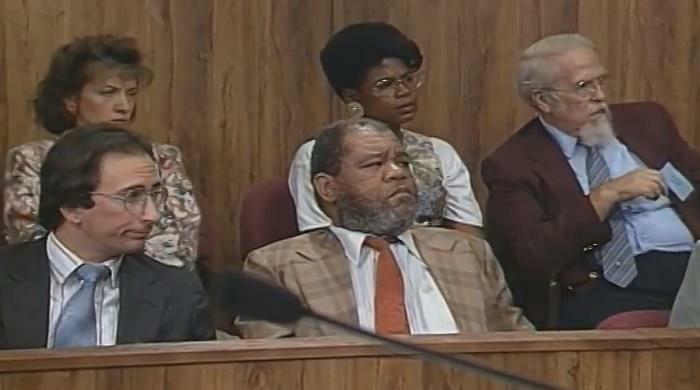 The company then detailed two more appearances: "Beginning at the 5:13 mark, the actor depicting the inventor is shown meeting with an actor depicting a patent prosecution attorney in a law office, and again is using his Apple laptop computer," and "the inventor's Apple computer is clearly visible again beginning at the 11:22 mark." 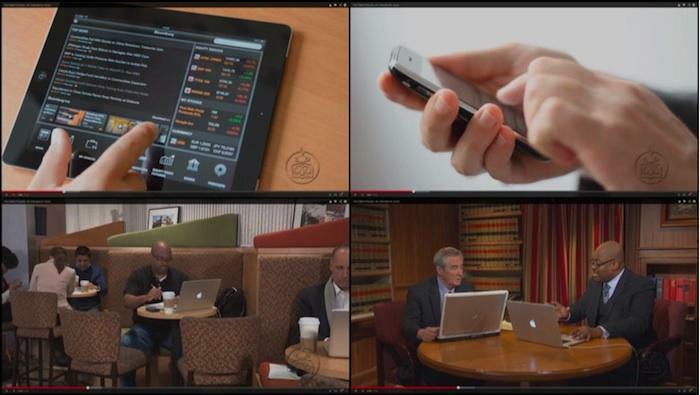 The objection filing included screen shots of the video (below) where a device can be identified as an Apple product. "At a minimum, the video strongly suggests that Apple's products are innovative and patentable," Samsung's attorneys complained. The majority of the computers shown in the video are Windows machines from a variety of makers, including prominent depiction of Dell logos on monitors appearing in the court setting and a series of generic Windows PCs being used within the U.S. Patent and Trademark Office to review applications.